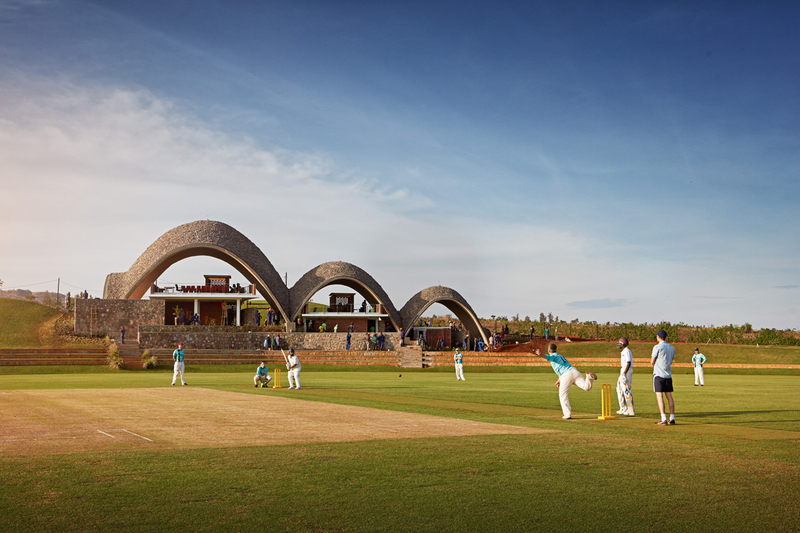 A series of three linked parabolic vaults lends a distinctive identity to the Rwanda Cricket Stadium at Kigali, while providing an economical enclosure for players’ facilities, a clubhouse and bar. For the building’s architect, UK- and South Africa-based Light Earth Designs, the chosen construction method offers even greater advantages, showing how the country might “transition from an agriculture-based economy to development using local home-grown labour-intensive construction techniques, thereby avoiding imports, lowering carbon, and building skills and economies”. The primary enclosure adapts the ancient Mediterranean method of tile-vaulting (using compressed soil-cement tiles) to a moderate seismic context by using geogrid mesh reinforcement between the layers, and by bearing the springing points of the doubly-curved vaults on the ground. 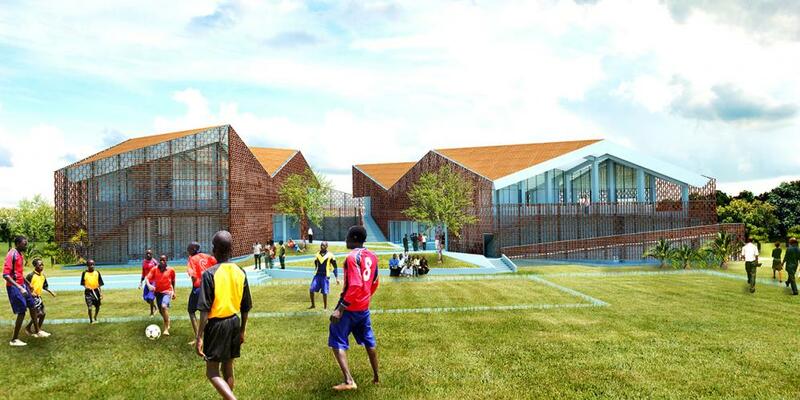 The vaults follow the natural resolution of forces toward the ground, “closely mimicking the parabolic geometry of a bouncing cricket ball and evoking the cherished hilly topography of Rwanda”, says the architect. The masonry vaults act wholly in compression, allowing the use of a simply-layered thin-shell composite of low-strength tiles. The design builds on research by engineer Michael Ramage at the University of Cambridge Centre for Natural Material Innovation alongside Ana Gatóo and Wesam Al Asali, and extends work done by Ramage with engineers John Ochsendorf (MIT) and Matt DeJong (Cambridge). With Peter Rich Architects, Ramage and Ochsendorf pioneered soil-tiled vaulting at the Mapungubwe Interpretation Centre in South Africa (2009). Light Earth Designs (architect Tim Hall, Rich and Ramage) went on to build The Earth Pavilion (UK), and offices for Joseph Ritchie (Chicago, USA), and have undertaken research in geogrid application in seismic zones conducted at the University of Cambridge. In Rwanda, the construction teams were trained by an expert mason, James Bellamy. Unfired tiles were made on site from local soil by local labourers, and were hydraulically pressed with a small addition of cement. They were laid in layers onto a temporary timber skeleton – again using both low- and higher-skilled local labour. The innermost layer was laid upwards from the perimeter, and held in place by a quick-setting gypsum mortar. As the first layer continued, successive layers of tiles were laid in a thin lime and cement mortar, inlaid with geogrid. The vaults span up to 16 metres, for which six layers of tile are required. The tiles were topped with a screed and waterproofed with a torched sheet membrane. On top of this a network of geogrid was laid, with a composite granite stone and lime/cement/ sand mortar mix. The structures were then topped with abundantly available local broken granite, which allows the building to blend into its environment as well as adding weight and consequent stability. Thin, simple concrete ‘tables’ were inserted within the vaults, providing enclosure for areas such as the changing rooms, and forming an open mezzine on which the clubhouse and bar are located. Bricks are used to define edges and form partitions between spaces, often laid in perforate bond to allow light and breezes to filter through. Low-carbon, agro-waste-fired bricks were sourced from enterprises set up by the Swiss non-governmental organisation SKAT Consulting. Retaining walls are either formed of local granite boulders or are hollow to encourage planting.